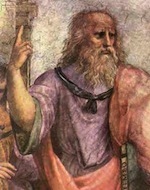 Plato's most popular dialogue, The Republic, argues for social justice by subjecting the individual to complete state control. The Republic also includes Plato's famous allegory of the cave.
" The propitious smiles of Heaven can never be expected on a nation that disregards the eternal rules of order and right which Heaven itself has ordained."